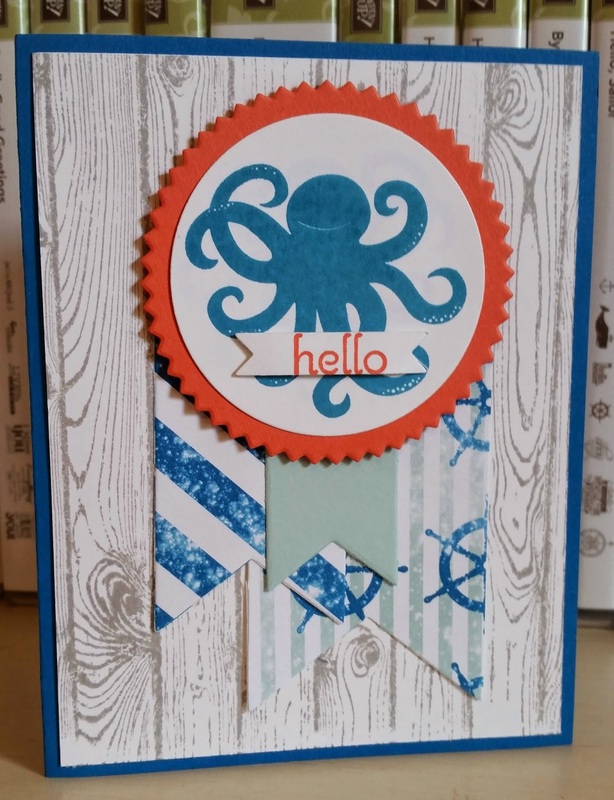 I used some left over pieces from when made this card in class in April and added my new friend, Eddy the Octopus and a quick hello banner to send this out to my mom. Hope she gets a chuckle at this eight arm friend! Love the Traveler stamp set in the new Annual Catalog! 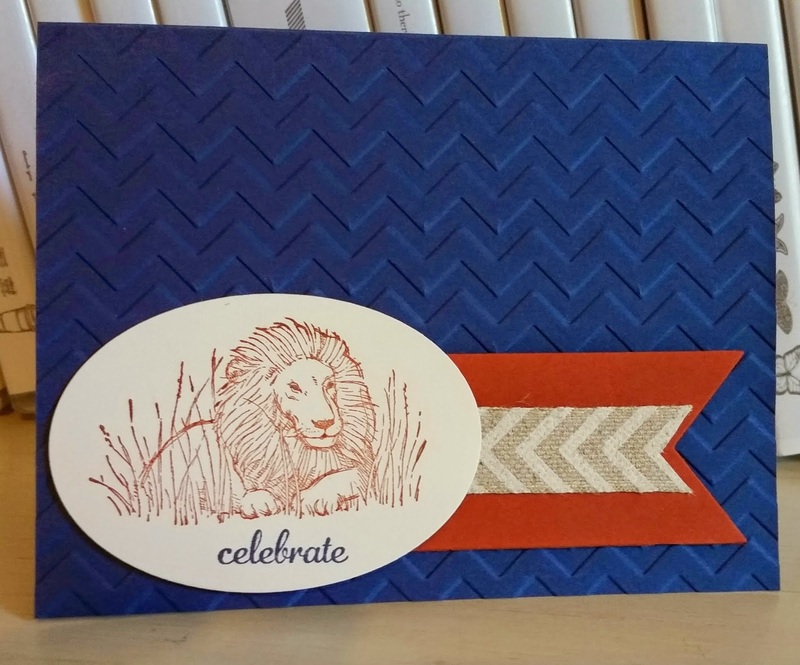 I cut these two images easily out by hand and then looked for a sentiment to fit my wavy banner die! We also made some small gusseted treat bags at club Tuesday night. 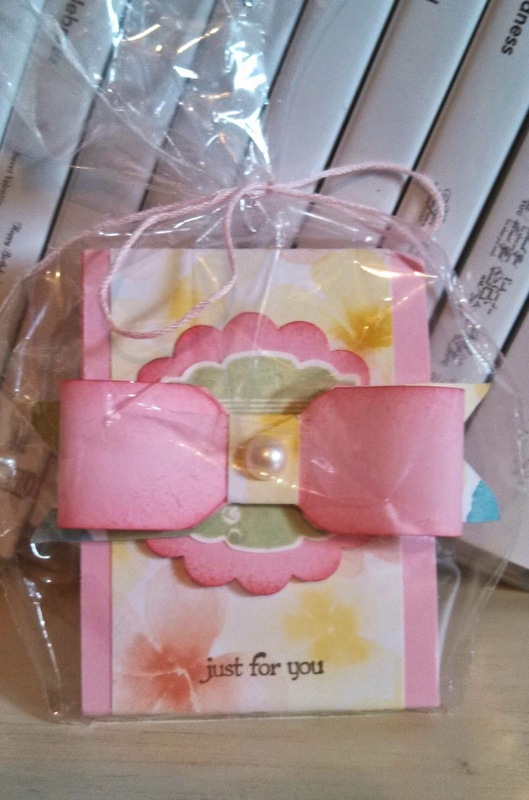 I saw these made at our catalog review party in April. 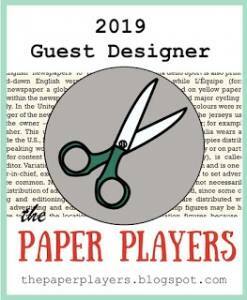 It uses a 4 1/2" x 6 1/2" piece of DSP which happen to be the size the Designer Series Paper Stacks come in and so easy to pull off a sheet and score, fold and adhere. 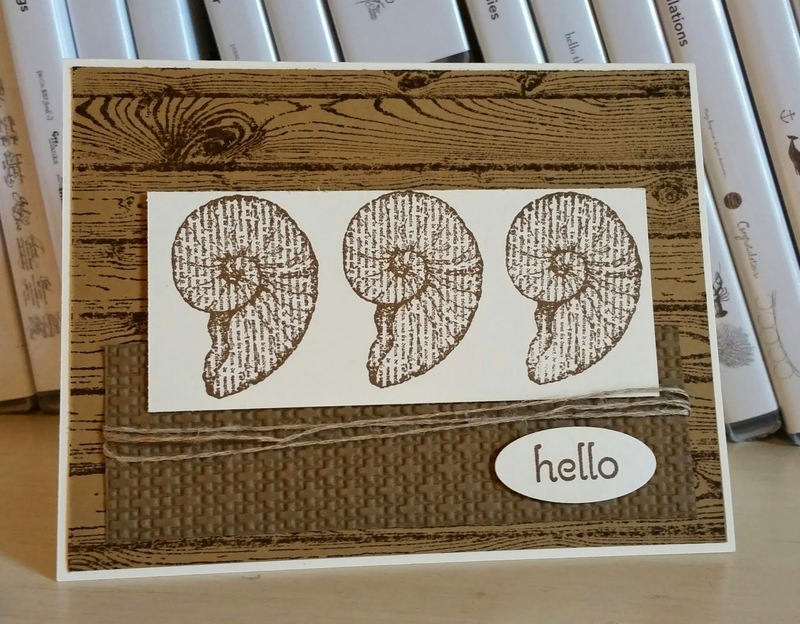 For Stamp club last night, we made these gatefold shutter cards. 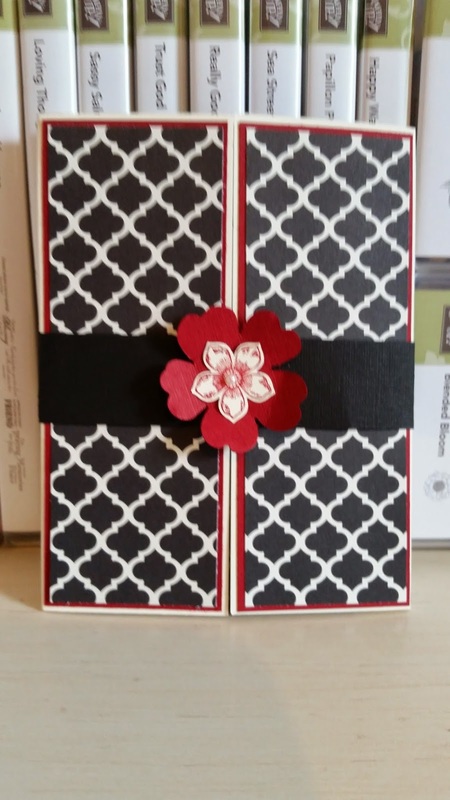 I love the black/red/vanilla combo! I made this for my daughter so used the love you sentiment from Express Yourself for her secret message inside the shutter! 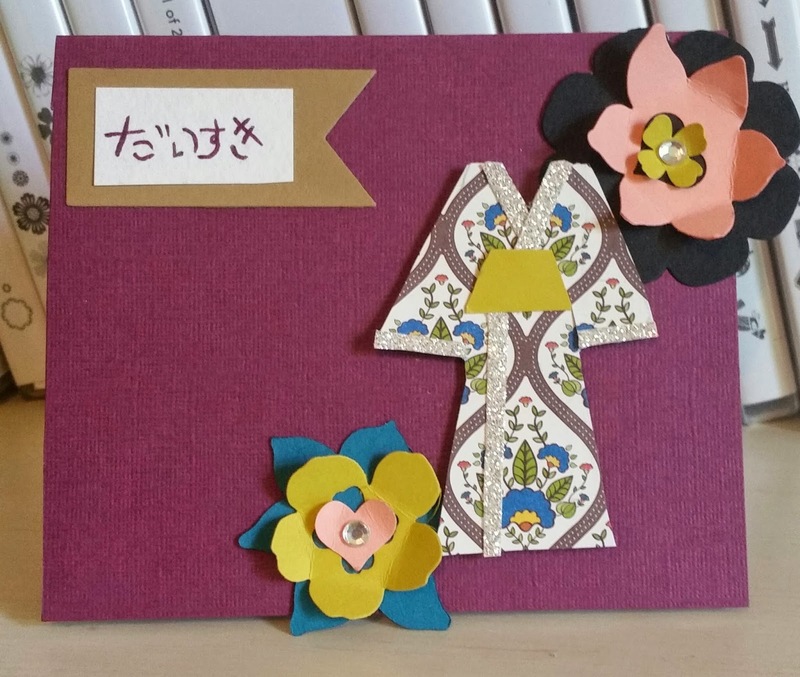 I made this card for one of my best friends celebrating her birthday next week. She loves black and hot pink together...her office is even decorated in those colors! 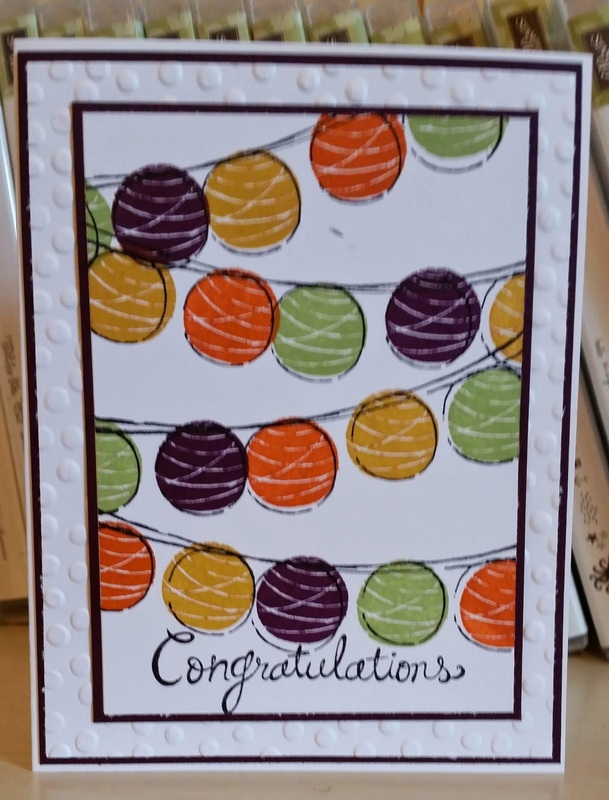 This card is for my friend and fellow Pretty Pal, Patti Carbonell. 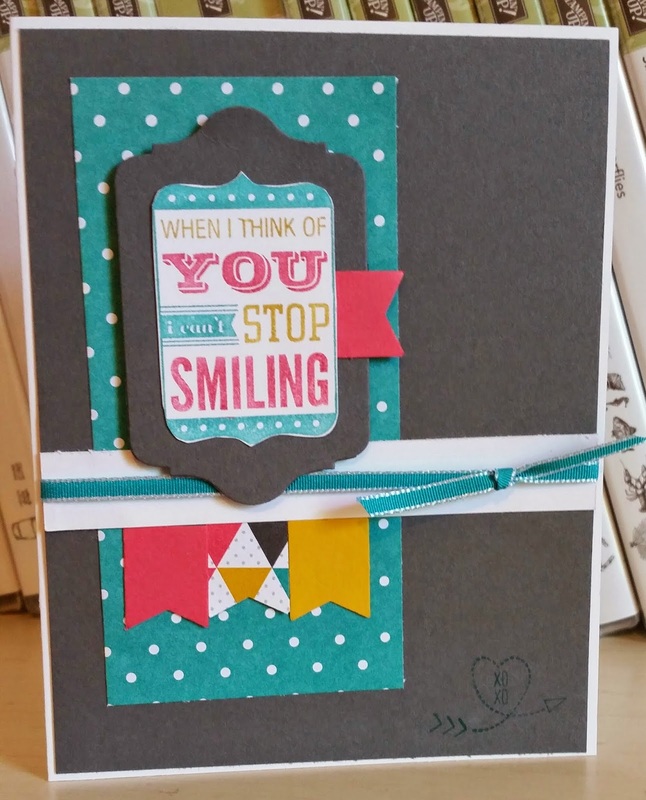 I cased this card from the wonderful Wendy Weixler from wickedlywonderfulcreations.blogspot.com. She did it in new Blackberry Bliss and Pink but I know Patti likes blues and greens together. 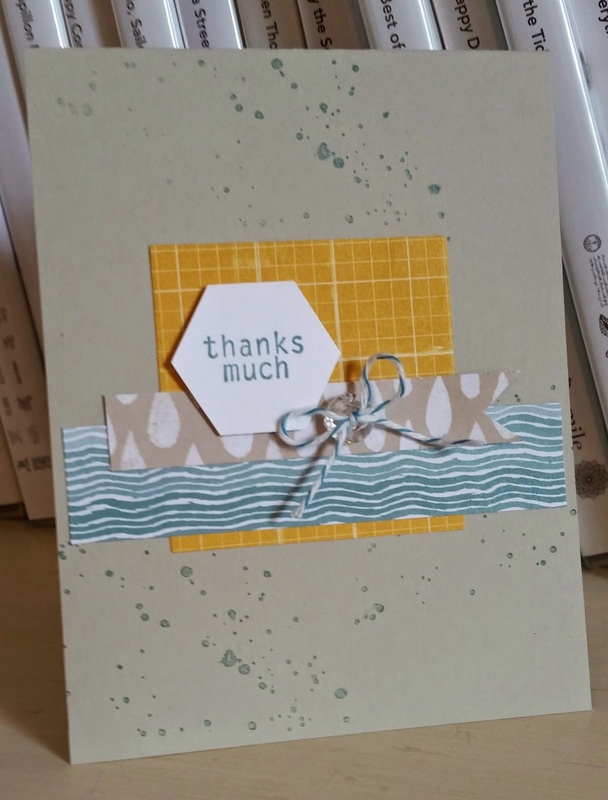 I wanted to keep it soft so used Pool Party and Pear Pizzazz together. I like how it turned out. 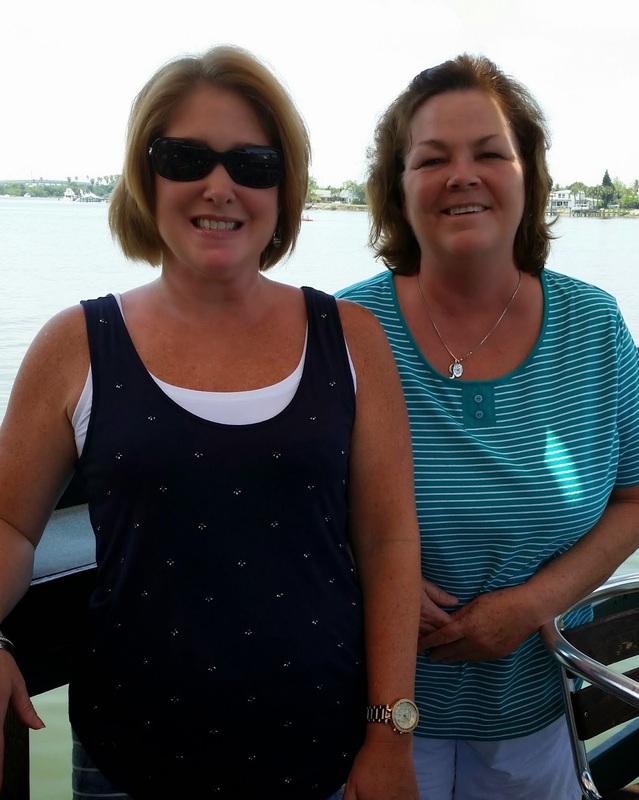 Patti, I hope you have a wonderful day and loads of fun! 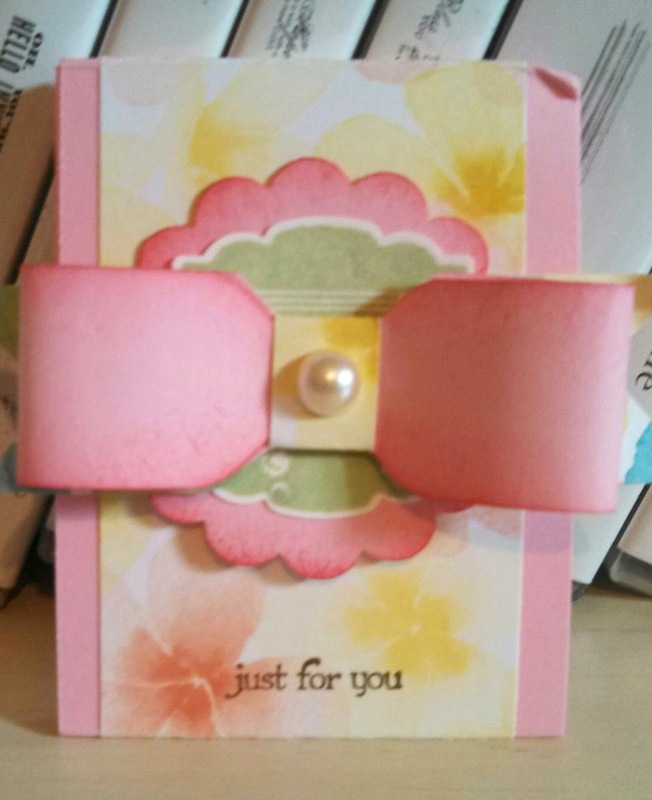 This is a card I receive last week from my friend Patti. 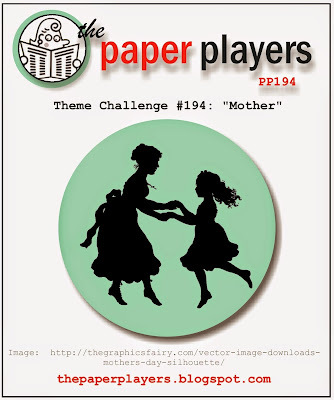 I love the simple design and I love the colors with the black and white. 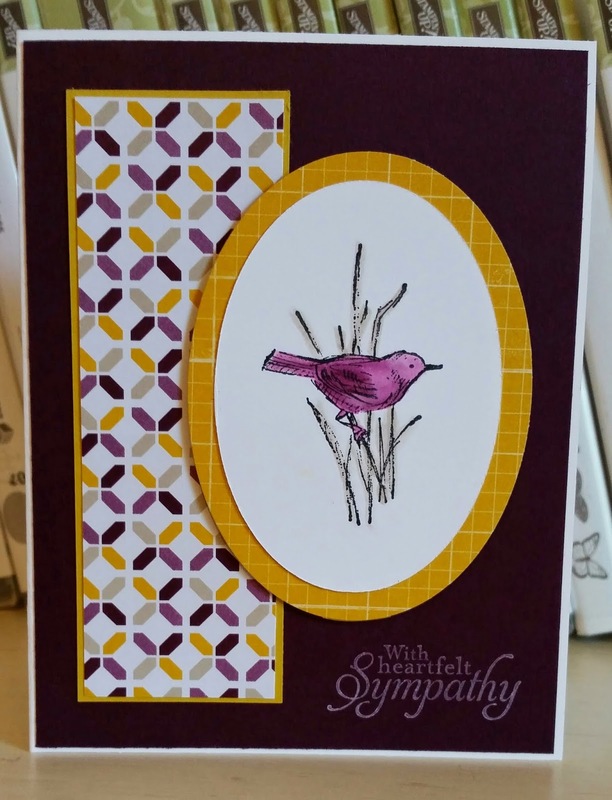 These are cards made on Thursday visiting my friend and fellow Pal, Patti Carbonell. 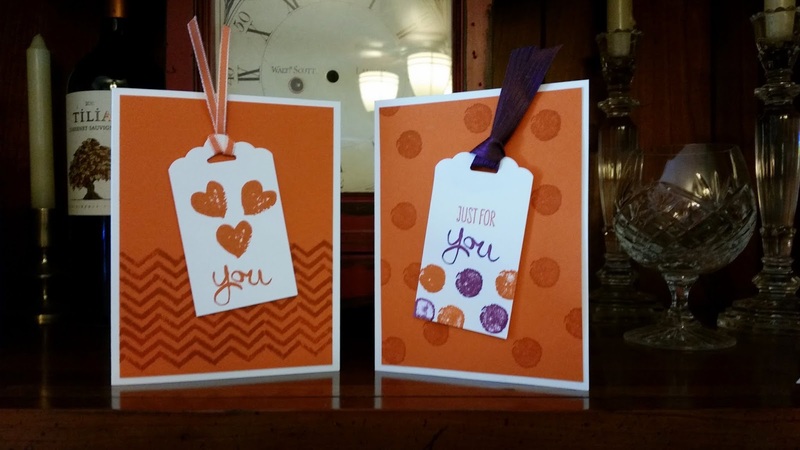 We played with the new in colors and and then the new Traveler stamp set. 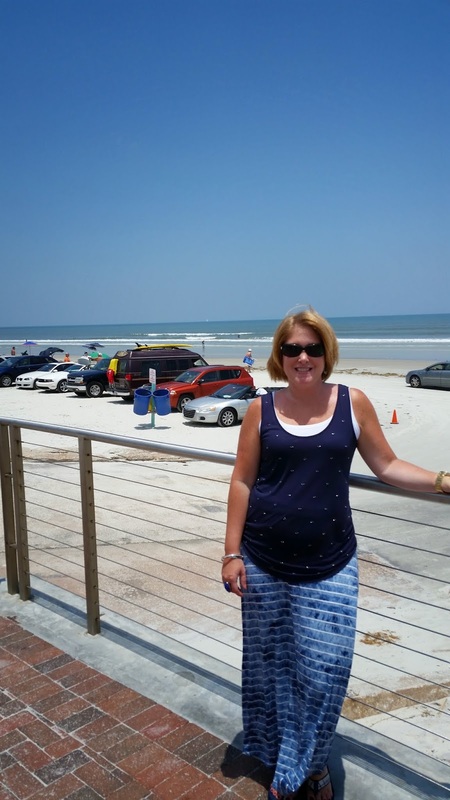 We also had a wonderful lunch near by the river and not far from the beach in New Smyrna. Have an amazing weekend and thanks for stopping by! For some reason when I saw this sketch I knew I wanted to use the Hardwood background then the shells and such came along easy. I hope your Friday is Fabulous and thanks for stopping by! Simple sketch today! I really like this image but it is retiring so it will now be vintage! I will probably keep it since I like this set and it has coordinating framelit dies. I hope your Thursday rocks and thanks for stopping by! 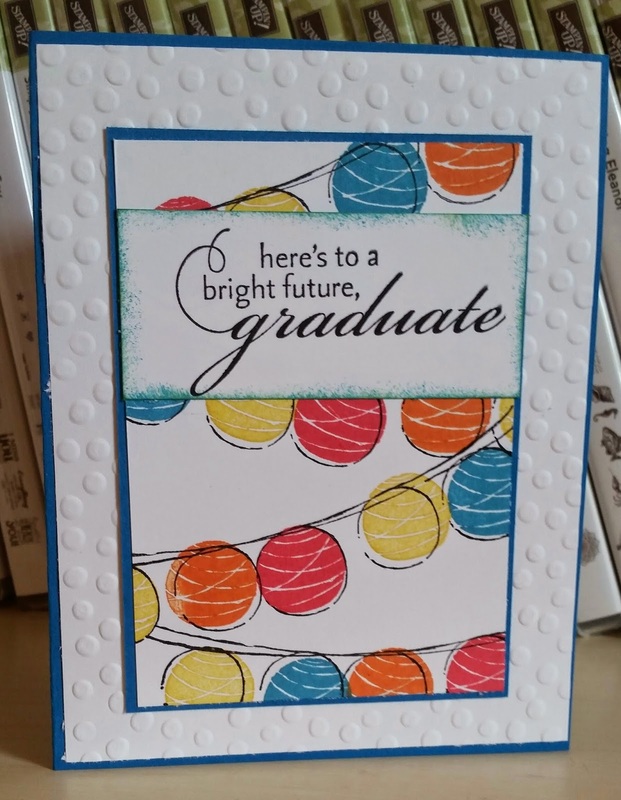 Another Grad card. 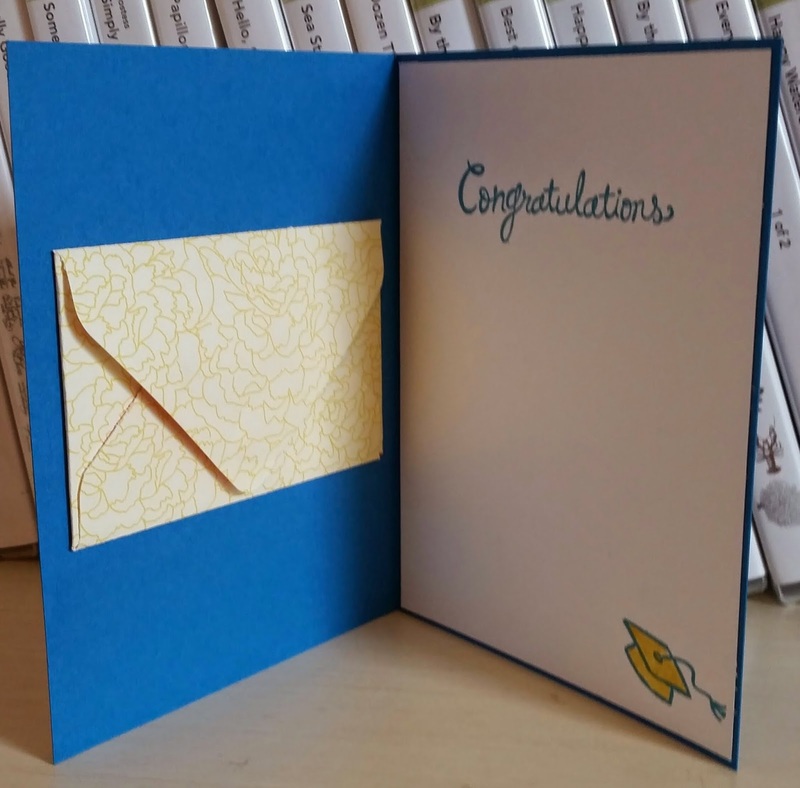 I love using this Happy Congratulations set! 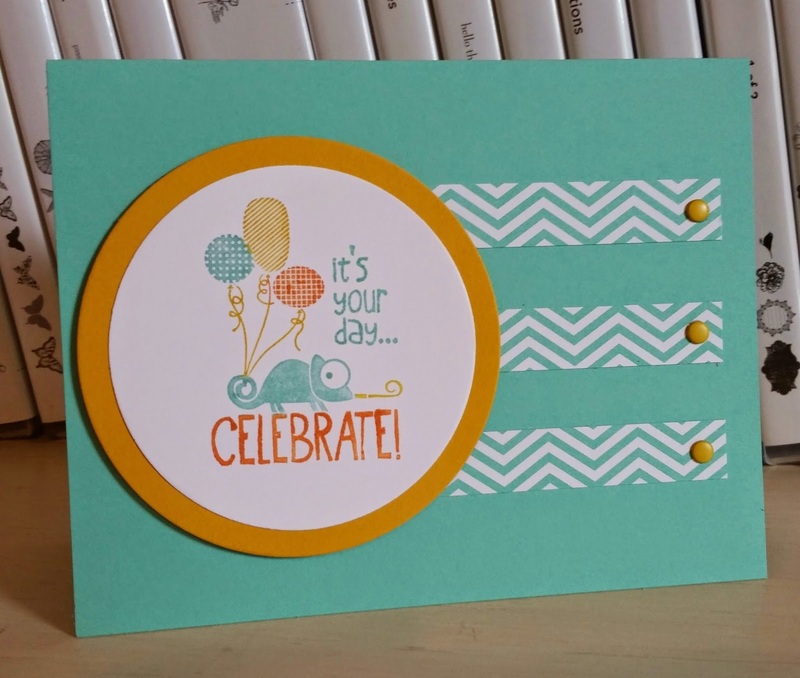 I used new colors available in the 2014-2015 Annual Catalog starting June 2nd. Another beautiful creation by my daughter Amanda. She really loves to work that Big Shot. 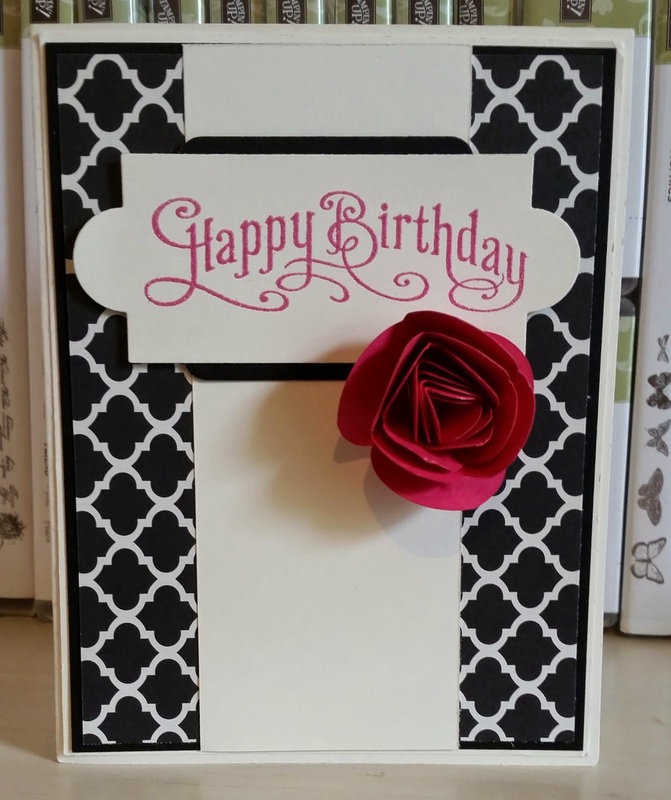 I love this card and her use of emboss folders and colors. 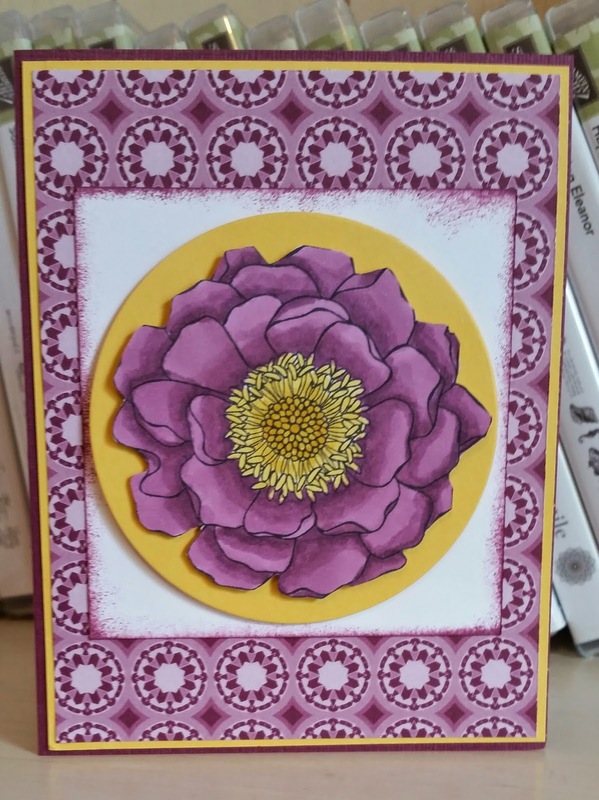 I did want to play with the Happy Watercolor set and my Blendabilities markers soon and this challenge gave me a wonderful chance for showcase this flower and the Watercolor Wonder DSP. 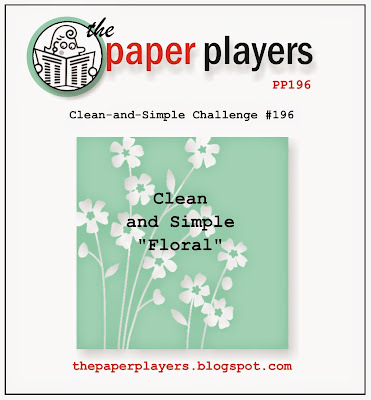 I love this particular pattern from the DSP...so soft! Thanks for stopping by and I hope your Monday is blooming! 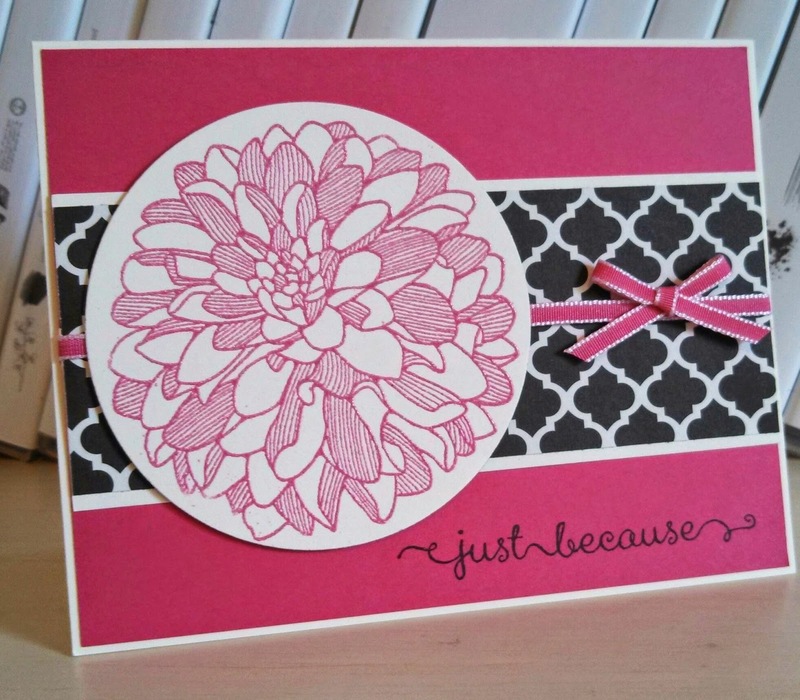 I used my new blendabilities to color the Blended Bloom stamp. The new pens are alcohol based marker that come in a pack of three shades-a light, medium and a dark. 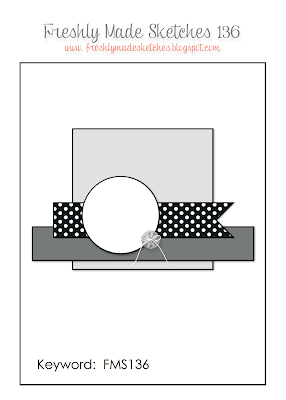 I finally to play with the Rich Razzleberry set this week and then decided to fussy cut it and pop up on a circle but the rest of the layout i could not decide on. I finally found some old DSP in Razzleberry to place behind. 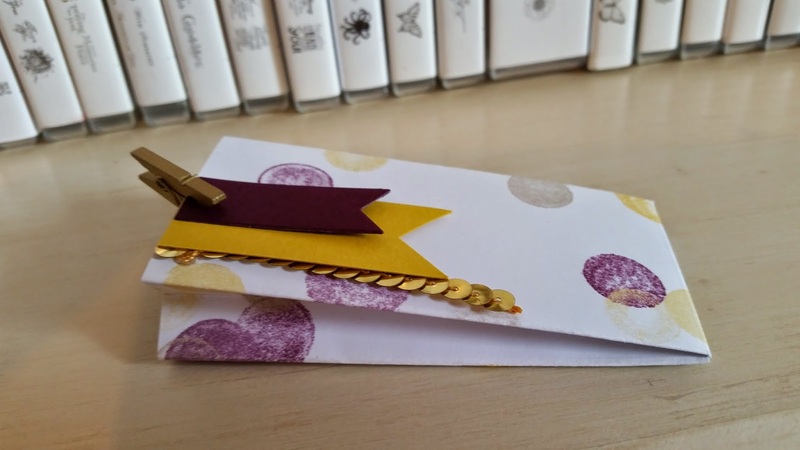 I have started the grad cards! I have an open house for a friend today and one next weekend and a few more after that. 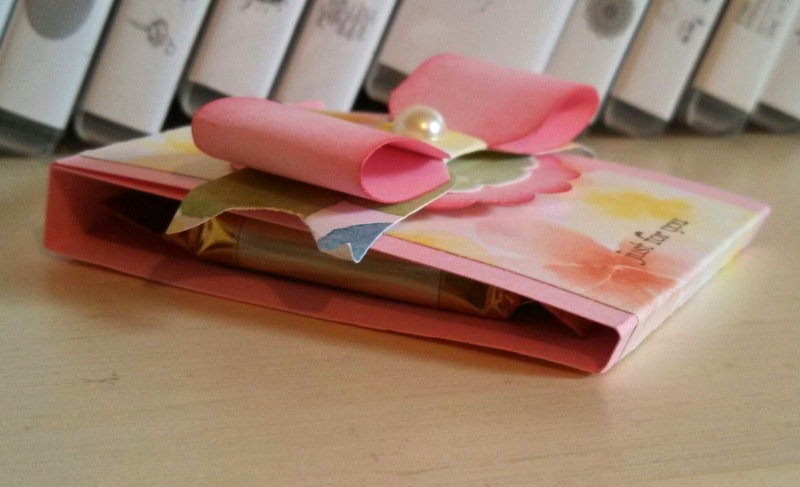 I added the envelope to the inside to hold cash. 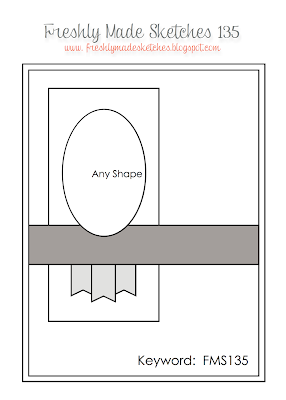 It is the right size for a gift as well (dimensions 2" x 3 1/2"). 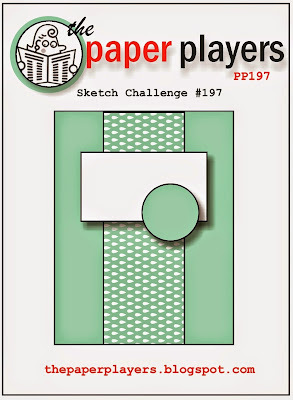 Cool sketch from Amy this week at Freshly Made Sketches! I had the new Moonlight DSP stack on my desk so decided to go with those colors and designs. 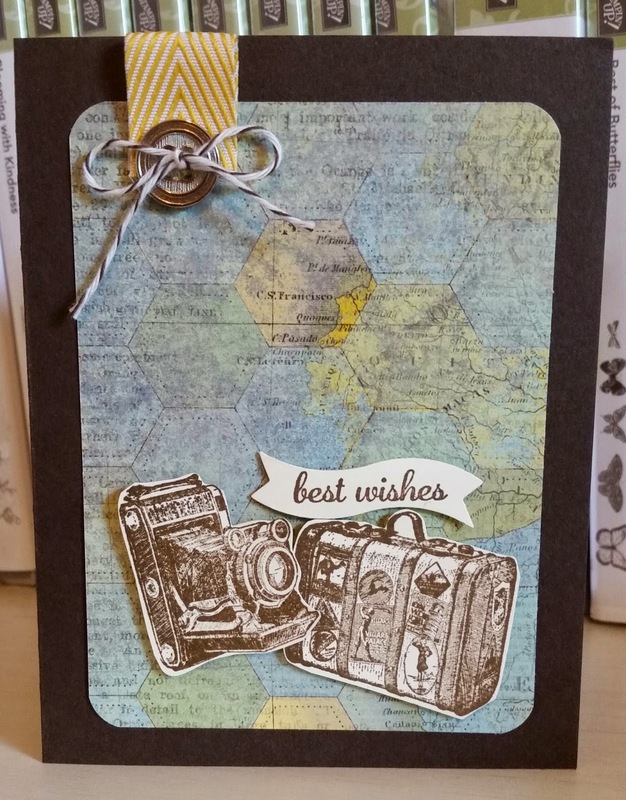 I was trying to go with something other than a circle and glad I pulled out my hexagons. 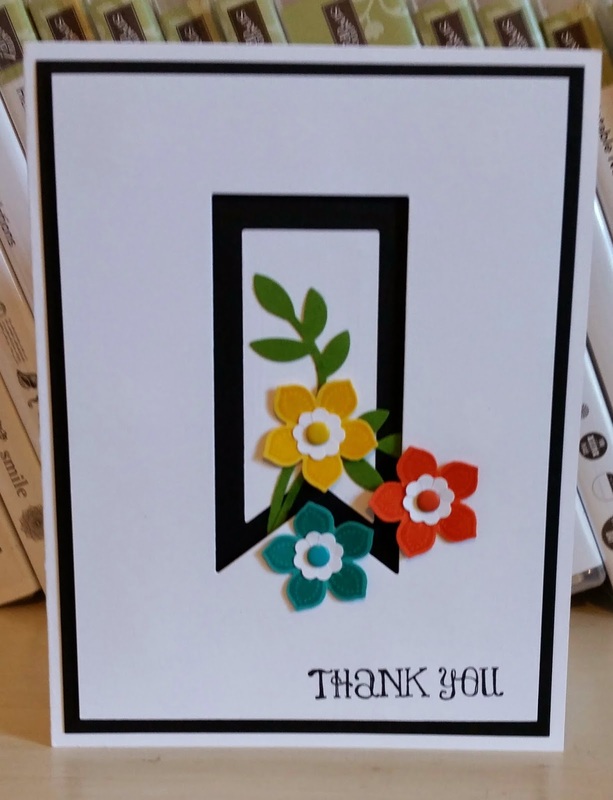 I had a customer buy several of my thank yous from my stash this week so used the thanks much. Hope you have a fab Friday and thanks for stopping by! My first time playing with new set Sea Street and matching DSP. It was fun playing with Mr. Octopus but then what sentiment goes? 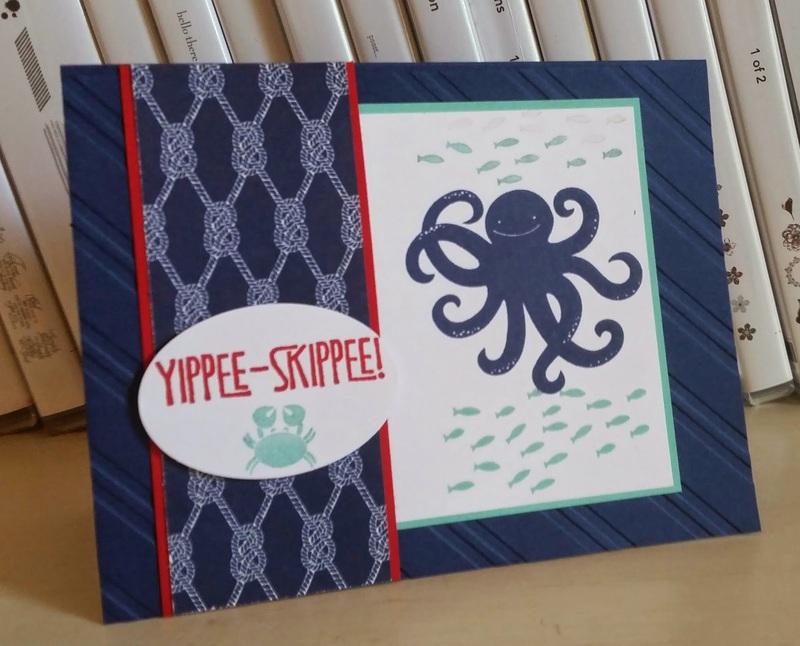 I choose some yippee to go with the sea friends! 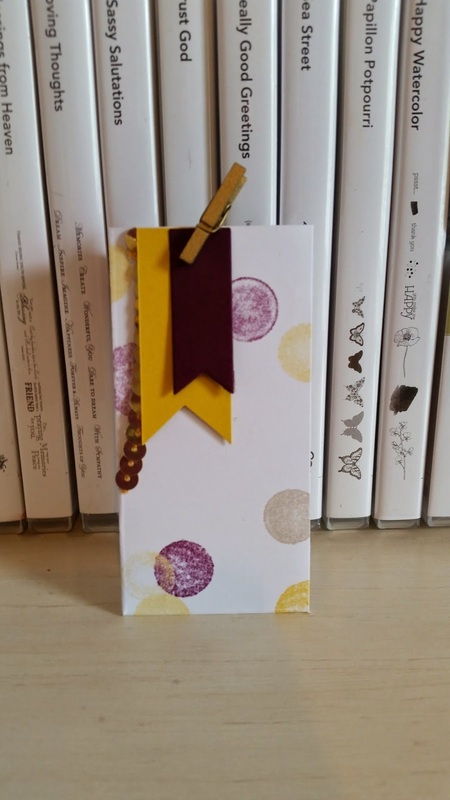 Here are a couple of cards my daughter made when home last week. She likes having some with her at school to use for when an occasion comes up. She was so proud designing her own cards. She loves to work the Big Shot, too. I hope your Wednesday is awesome and thanks for stopping by! 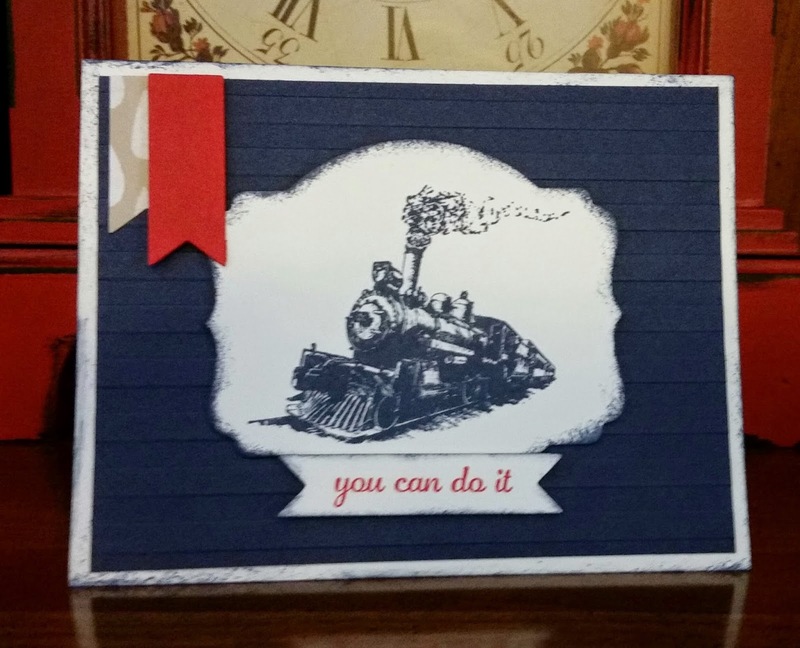 This card is for my card classes this week. 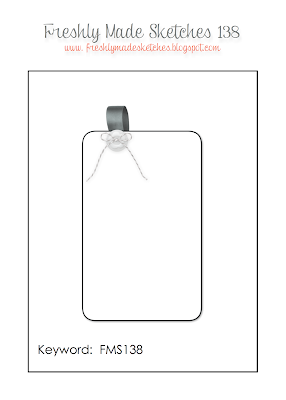 It features new in colors like the Blackberry Bliss on the card front. I love having a new purple..was hoping for an orchid type shade but this color is so rich. 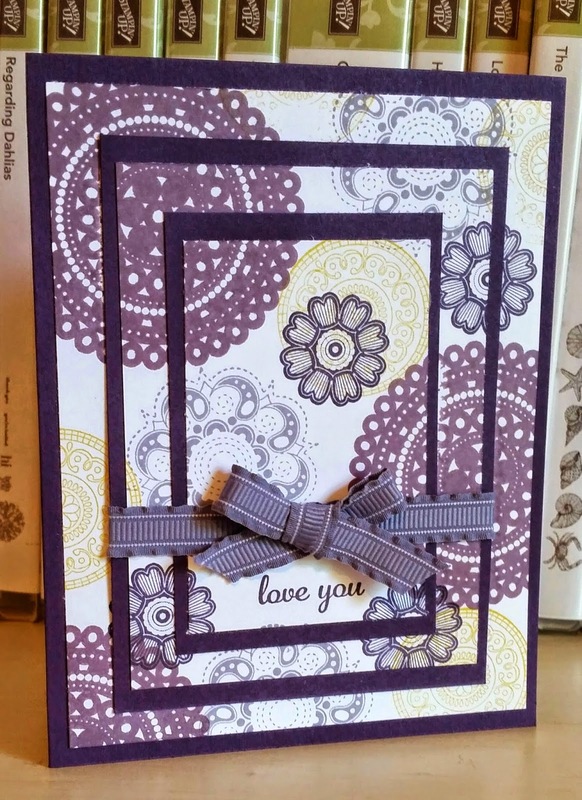 The DSP stack called Moonlight used above on the panel and the oval has the Blackberry and Hello Honey and neutral shades. I like these colors together. Thanks for stopping by today and hope you have a lovely Tuesday! I like this color challenge and my mind went to flowers when saw these colors but then I wanted to do something other than flowers. 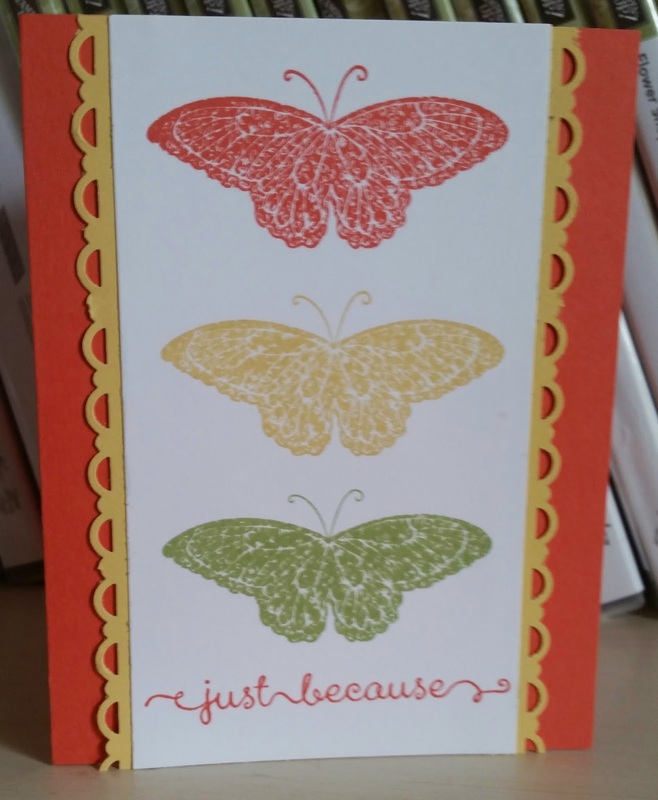 I then thought of my butterflies and how I love this one butterfly stamp I used on this card. I also love the script in this sentiment. I wish there was a whole set in the same font/script. Actually it is my first Mother's day without my first born with me. My college girl left yesterday to head back to school for 6 weeks of summer classes and returns home around June 21st. We went out to celebrate Friday night and I have my baby (who is 16) here today but it just ain't the same! Love that girl. 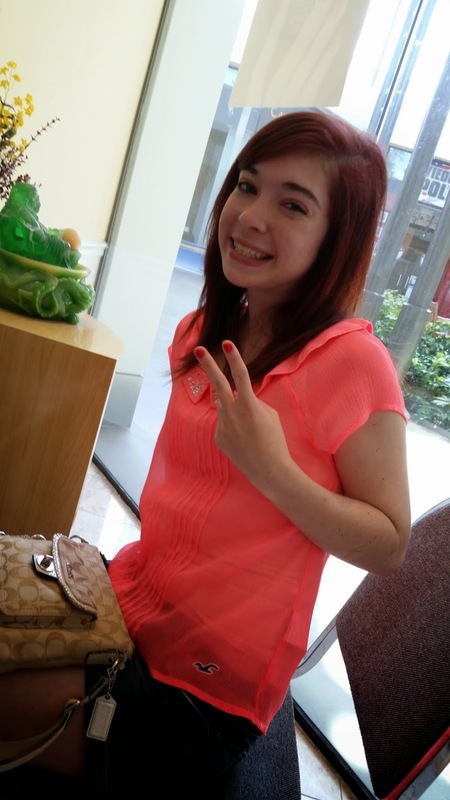 We went to get our nails done together on Wednesday (pic above). She made several cards herself while home but I just love this one! This was my Mother's Day. 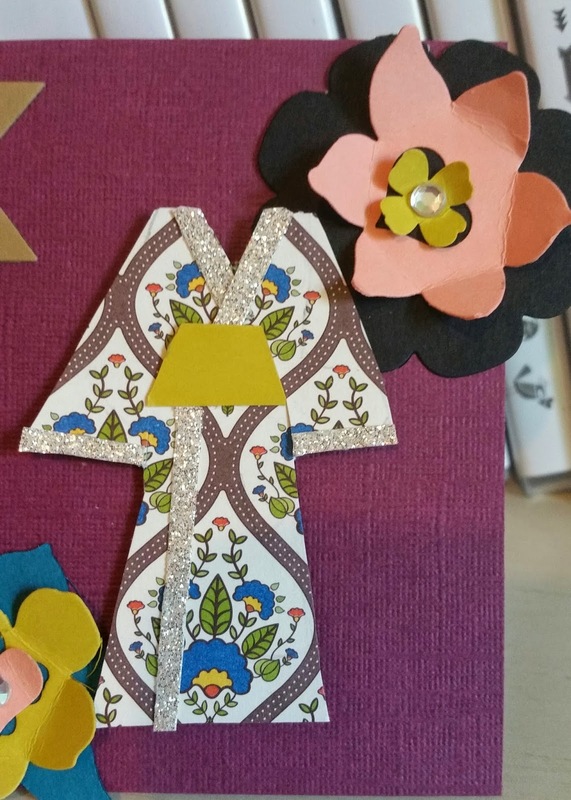 She made the kimono herself. She also works the big shot like a pro! It says love in Japanese. . Here is a pic of my baby boy so I am not showing favor! 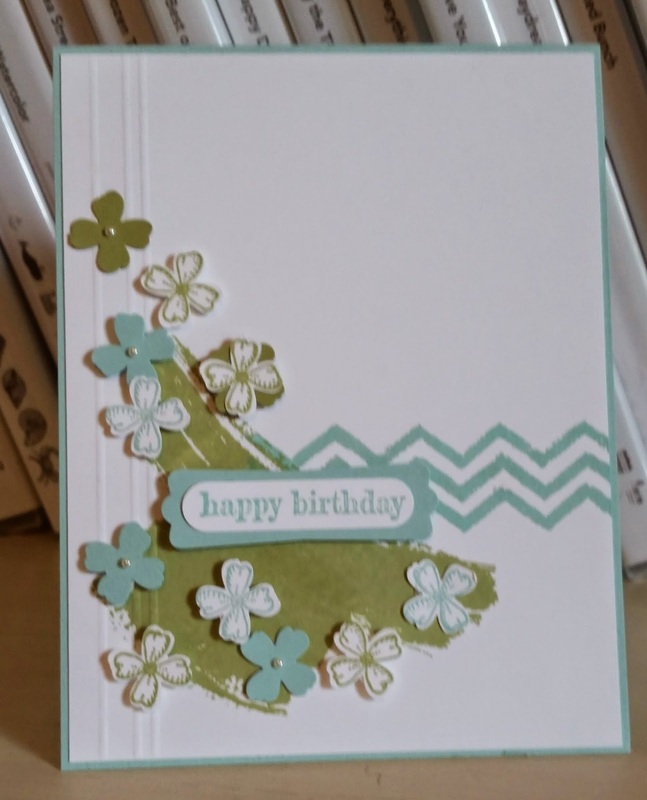 Playing around with a new stamp set called Work Of Art! Love all the paint/brushstrokes! I made it look like it is framed! Much more crisp looking in person! I thought this would make my mom smile. I went with bright colors that pop on the Basic Gray. 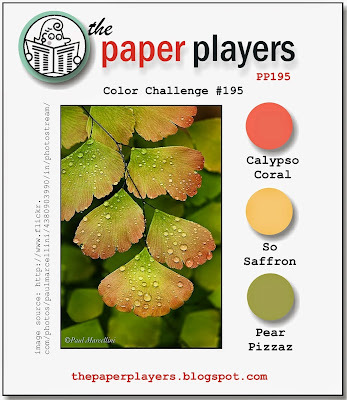 Color Challenge...hard for me! But this one I knew it would be masculine card and what set I wanted. 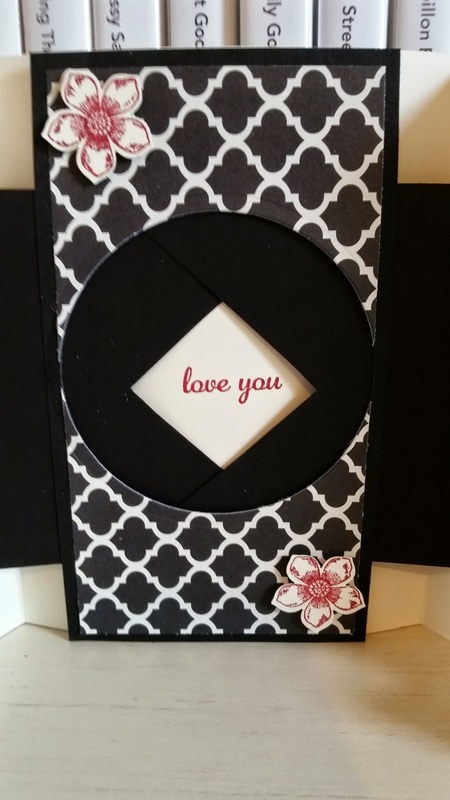 It is simple but love the texture! 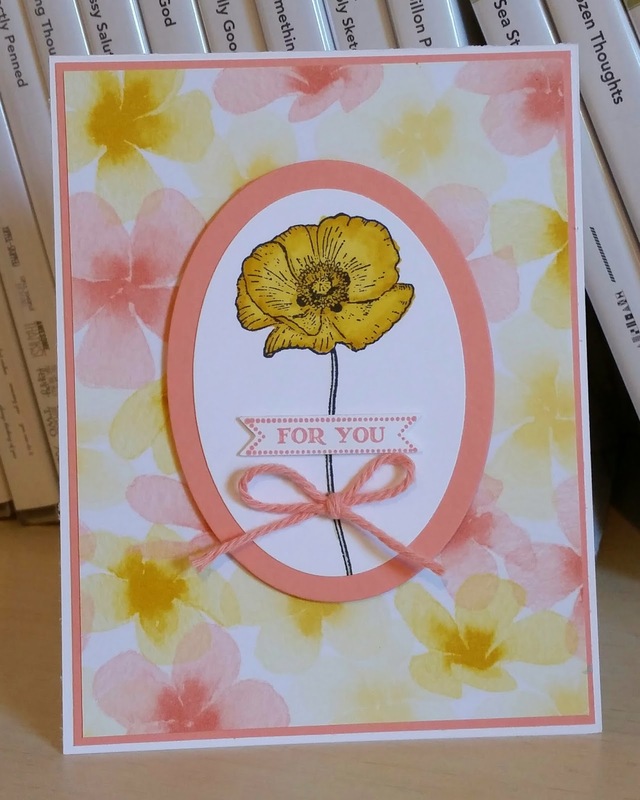 Another card for card class next week. 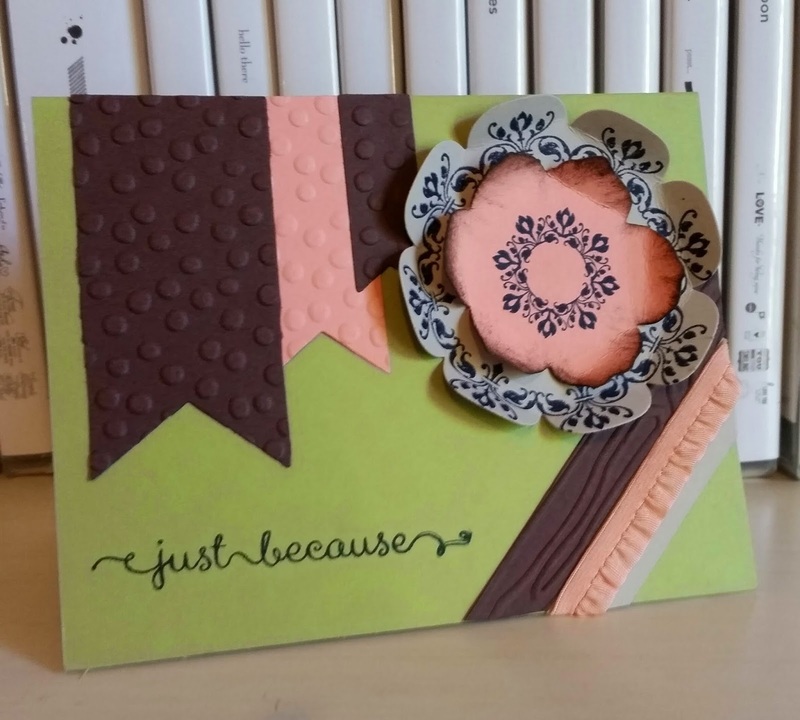 I knew I wanted to use this set and then thought of my Melon Mambo emboss powder to emboss the flower. Love the way it turned out! First, I want to say Happy 24th Anniversary to my wonderful husband, Mark! We will be celebrating tonight at an Italian restaurant we both enjoy! 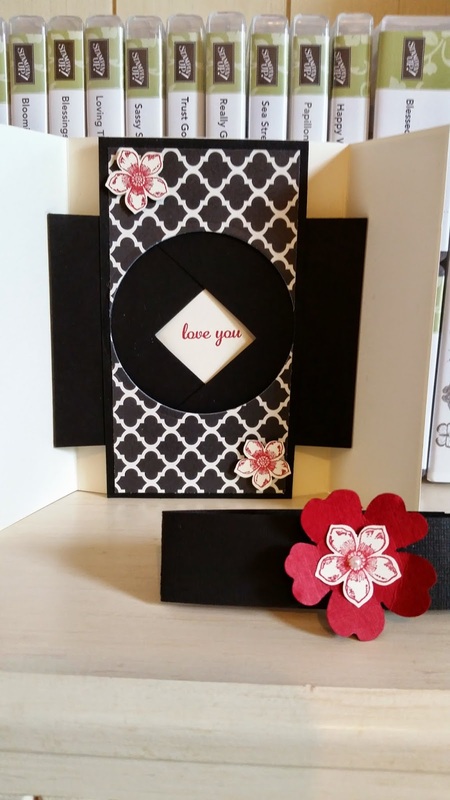 I know Mother's day has not even happened yet but we will do this card next week at card class for Father's day or can be any occasion! 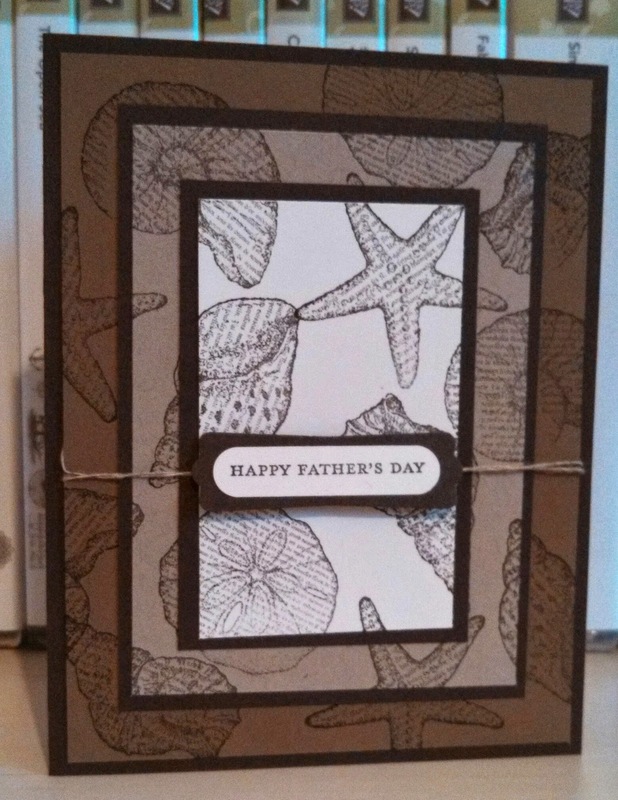 I got this inspiration from my friend and fellow demo, Brian King from stampwithbrian.com. 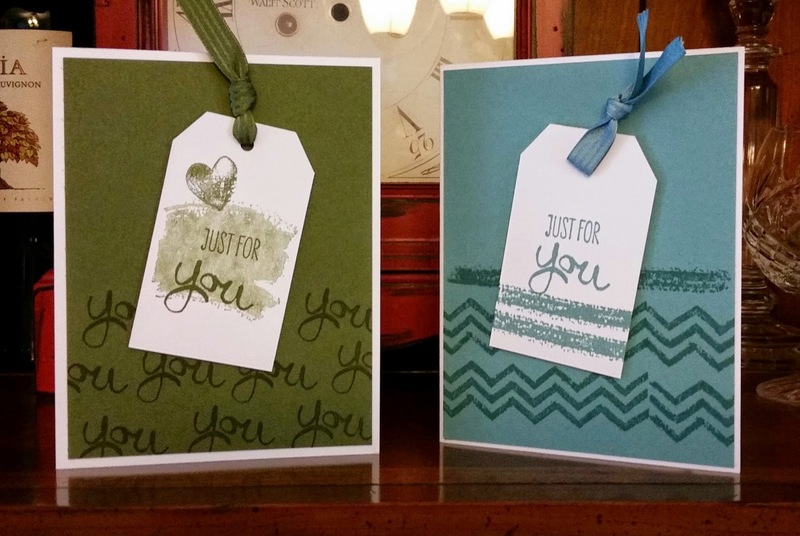 I love the triple time stamping but love it even more with the use of several different card stock colors! First, Happy Cinco de Mayo! On Monday night, I attended a special event for demos! We were not only able to see the new catalog, but get it in our hands! That was special but the most fun was meeting up with 4 other Pals and eating and visiting before hand and experiencing the new catalog reveal together, too! My friend and fellow Pal, Frenchie, gave us these candy/treat holders she made! Love it! The colors and the chocolate! Enjoy your weekend! My college girl is home for about a week and we will be shopping!